This Christmas surprise your family with delicious Christmas recipes from the authentic fruit punch, romeritos, cod, turkeys to Christmas desserts and original ideas for Christmas gifts. We give you the best and original recipes of Turkey. Give a delicious and special twist to your recipes. Enjoy a rich Pavo de Pavo or a Pavo al Pibil. What do you expect to cook? Find the healthy part of Christmas, these Christmas Salads are perfect to accompany your main courses. Prepare the traditional recipes of Apple Salad, Potato Salad or Marshmallow. You like them? Inspire yourself in these easy recipes for Christmas cakes and sweets, such as the traditional Fruit Cake or a rich Bitter Chocolate Trunk. What is your favorite? If you do not know what to cook as a main course for Christmas, see these classic Christmas recipes that you can cook easily and quickly, from romeritos, pork loins or a rich cod. We bring you some examples of how the streets are decorated in different parts of the world. We know that the expenses in December are imminent and the issue of saving worries some. A proposal of inexpensive dishes, easy to prepare and sophisticated for a spectacular Christmas dinner. Find the best baked leg recipes, discover the variety of ways to prepare this delight using the oven. Find the best punch recipes, it is a delicious holiday tradition. Here you will find from the traditional punch to a spicy punch. Do you like romeritos? These recipes will enchant you. Dare to cook them in different ways, such as a Hojaldrada Roscado de Romeritos, Lasaña de Romeritos or a Timbal de Romeritos. Start the Christmas dinner with a delicious soup, you will surprise all your family with these spectacular recipes from a cream of mushrooms to a delicious cream of walnut and pistache. This Christmas gives a nice Christmas cookies from the classic decorated Christmas cookies, gingerbread cookies and other more creative recipes that children will love. Prepare these delicious garnishes to accompany your Christmas dishes. We give you easy recipes with potatoes, delicious purées and some healthy vegetables. Be amazed with these delicious tamales recipes. Find here the secrets for perfect tamales, from traditional red tamales to delicious tinga tamales. Delicious dishes made with the leftovers of the Christmas dinner. You will not believe how easy and fast it is to cook them. The best cooking recipes to prepare this Christmas, follow the videos step by step and surprise everyone this Christmas. Follow the step by step of these videos to prepare your Christmas dinner easily and quickly. 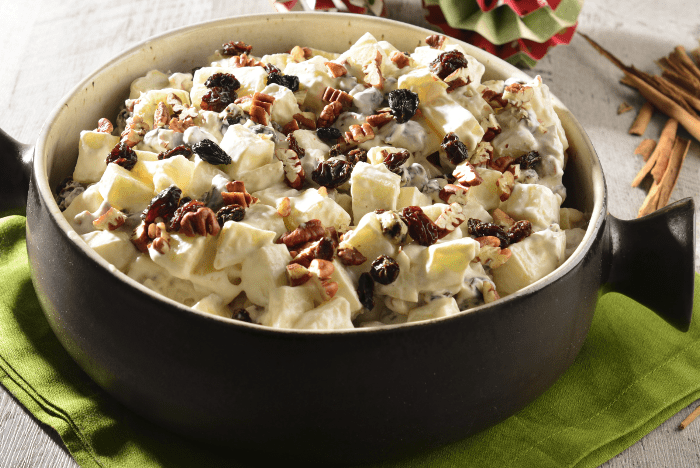 Delicious sweet salad to accompany all the Christmas dinner dishes. Prepared with apple, pineapple, walnut and raisins. This traditional dish is perfect to share and celebrate these holidays in the company of your loved ones. A delicious recipe to impress the whole family this Christmas. The secret of the recipe is behind using a smoked turkey which makes it possible to cook in just 1 hour. This Grandmother's recipe for cod Viscaína style has been the secret of my family every Christmas. I share it because it's really delicious and typical to eat at that time of year. It will also be useful for Lenten dishes. Lasagne is a rich Italian dish consisting of sliced pasta stuffed with ground beef and tomato. Meatloaf recipe prepared with vegetables, ketchup and English sauce. Rich and easy to like children. A delicious holiday tradition. Jamaica, tejocotes, tamarind, guava and apple are mixed to give life to this exquisite hot fruit punch. Pork Leg cooked with almonds and prunes, covered with pineapple slices. The leg is marinated for several hours in a mixture of cider, garlic and onion. A perfect recipe for your Christmas or New Year's dinner. Prepare it! This rich recipe for mashed potatoes is easy to follow and prepare. Accompany your meat dishes with this recipe for mashed potatoes. Delicious butter cookies decorated with colorful Christmas frosting. Secret Tip: For your cookies to last longer put them in an airtight container. This recipe for Christmas Turkey is delicious. Secret Tip: When injecting the turkey it is important to make as few holes as possible so that the juice does not come out. Use the same hole to put the syringe to other sides of the turkey. The famous recipe for the best gingerbread cookies. You can make them with the traditional doll shape or in circles and give them away at Christmas. They are a classic that can not be missed. As a gift they are a very good option or to share with a glass of fresh milk. Prepare this recipe for a delicious spicy leg. The leg is of pork and it is covered with a sauce of 4 chiles, without a doubt, you will ask for more. It is said that a good shrimp soup is an effective remedy to fight a hangover after a night of parties. Try it for yourself! It is a rich cream of mushrooms accompanied by a few balls of cream cheese with sesame, delicious as a starter for a nutritious meal or simply for children's dinner. Baked chicken is a rich dish and much easier to prepare than it seems. It is also a great alternative to Christmas turkey. We believe that wrapping gifts is an easy task, but in reality it is difficult to make them perfectly, follow this step by step and learn how to wrap perfect gifts. Setting the table at Christmas is important because it helps to decorate the house, with this step by step how to fold napkins in the shape of a Christmas tree, complements the decoration and increases the Christmas spirit. The Advent Wreath is a very important element to start the celebrations of Christmas, follow this step by step and learn how to make an Advent Wreath. This is a super original way to make a birth. Since with this incredible way to decorate the cookies you can give this incredible detail this Christmas.